The Greater Oklahoma City Chamber recognizes the benefits of partnerships when working to represent the business community and create a pro-business climate statewide. In 2019, the Chamber will work together with the State Chamber of Oklahoma and the Tulsa Regional Chamber to lobby the State Legislature on behalf of businesses statewide. The Chambers support defending and improving the comprehensive workers’ compensation reform legislation passed by the legislature and signed by the governor during the 2013 session. The Chambers also will pursue legislation to enact or modify an incentive to address the statewide shortage of software engineers. The Chambers support retaining economic development programs that create and maintain jobs and encourage investments in Oklahoma including Tax Increment Financing Districts and Business Improvement Districts. The Chambers support the Oklahoma Incentive Evaluation Commission (IEC), which was established to evaluate all business tax incentives at least once every four years and make recommendations to the Legislature and Governor to ensure the accountability and effectiveness of Oklahoma’s tax incentives. These evaluations will show whether tax incentives were successful, cost-efficient and how they can be improved to achieve the expected outcomes that benefit our communities and Oklahoma’s economy. The Chambers support preservation of individual and corporate tax cuts/savings contained in the federal Tax Cut and Jobs Act of 2017 by opposing efforts to conform Oklahoma’s state tax law to federal law. The Chambers’ position protects Oklahoma businesses against increased federal taxes and would not impact state revenue collections. The Chambers are fully supportive of the 2nd Amendment to the U.S. Constitution and the responsible expansion of gun-owners’ rights in Oklahoma. However, the Chambers will oppose legislation that would allow open/concealed carry of guns into high-economic impact events (many of which are contractually required to prohibit weapons), including Horse Shows, the Oklahoma and Tulsa State Fairs, Olympic Qualifying on the Oklahoma River, High School Basketball and Wrestling Tournaments at the State Fairgrounds and NCAA and Big XII sporting events (including the Women’s College World Series, College Baseball, and NCAA and Big XII Basketball and Wrestling Tournaments). The Chambers will also oppose legislation that would allow guns to be carried on college campuses, limit a business owner’s rights to prohibit weapons or allow guns to be carried by individuals who haven’t been tested/trained and do not have a permit. The Chambers support the efforts of the “Oklahomans for Business and Property Owners’ Rights” coalition to defend against harmful gun legislation. The Chambers support legislation and funding for sentencing reforms and rehabilitation programs to ease the financial drain on Oklahoma’s criminal justice system, lessen the burden on jails and prisons throughout the state and allow non-violent offenders to enter the workforce more quickly, while balancing public safety needs. The chambers support legislation to protect an employers’ right to maintain a drug-free workplace and to enforce policies to prohibit employee impairment during work hours. The Chambers support protecting the pension reforms which have improved the long-term fiscal condition of the state. 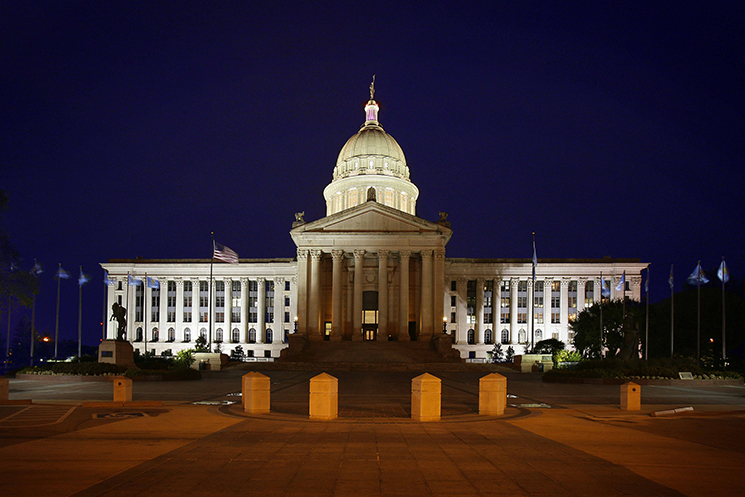 The Chambers support a stable oil and gas tax structure which promotes the investment of drilling capital in Oklahoma. The Chambers support continued funding for i2E programs, including the Seed Capital Fund. The Chambers support the constitutional provisions of the Tobacco Settlement Endowment Trust (TSET) to support the public health of Oklahomans. The Chambers further support broadening Insure Oklahoma to provide health insurance coverage to more of the state’s uninsured. The Chambers support maintaining physician training funding for the state’s two largest medical schools in the base budgets of the University Hospitals Authority and Oklahoma State University Medical Authority. The Chambers support the following initiatives to address health care disparities: 1) incentivizing the recruitment and retention of primary care physicians, specialty physicians and allied health professionals in rural and underserved areas; and 2) expanding residency programs for the state’s medical schools. The Chambers support efforts to identify new funding streams dedicated to these initiatives. The Chambers support providing adequate annual dedicated funding necessary to preserve and implement the Oklahoma Department of Transportation’s (ODOT) eight-year construction work plan. Furthermore, the Chambers will strongly oppose any effort to divert dedicated transportation funding to other areas of government. The Chambers support providing adequate annual dedicated funding to implement ODOT’s Bridge Improvement Plan to repair or replace all of Oklahoma’s structurally deficient bridges on the state’s highway system by 2020 and further ensure that ODOT is able to maintain a nationally-leading bridge improvement program. The Chambers support the Oklahoma Turnpike Authority’s “Driving Forward” Turnpike Program. The Chambers will work with the Oklahoma Congressional delegation and ODOT to secure a permanent funding solution for the Federal Highway Trust Fund (including mass transit programs). The Chambers support a comprehensive federal infrastructure package. Building on the flexibility of previous multi-year transportation reauthorizations for a coordinated federal/state/local-based decision making process, a robust investment package will enable the state to achieve much-needed progress in addressing critical infrastructure needs. The Chambers support the development of a multi-year strategic plan that addresses the public education funding needs of tomorrow and emphasizes the skills needed to compete for college and career in a modern economy. The Chambers support addressing the teacher shortage through heightened recruitment efforts, rewards for teacher performance and experience, and incentives for teachers to work in high-priority areas. The Chambers support fully funding access for seniors in support of current law and expanding access to concurrent enrollment for high school juniors as funding is available. Oklahoma’s Promise is one of the most successful college access programs in the nation. The Chambers oppose legislation that would diminish the program’s focus on college access. We support efforts to increase the number of college graduates and to maintain the direct allocation of state funds, which ensures full funding of the scholarships earned by Oklahoma students. Increasing the number of credentialed and degreed Oklahomans through innovations and funding for higher education and CareerTech. This should include aggressively pursuing the goals of Complete College America. Concurrent enrollment to help achieve the Complete College America goals by enabling more students enter college and obtain a college degree. Development of more work-based learning opportunities such as internships and apprenticeship programs.